To achieve login/registration screen design I am merging multiple android layouts. I placed Scroll View as a parent element. This Scroll View makes your screen scroll in vertical direction to avoid hiding exceeding objects on the screen. Inside scroll view I placed Relative View. The main reason for using Relative View is to make footer always stick at the bottom. Finally I am using Linear Layouts for placing Header, Form and Footer. See the following diagram to get an idea about the layouts I used. 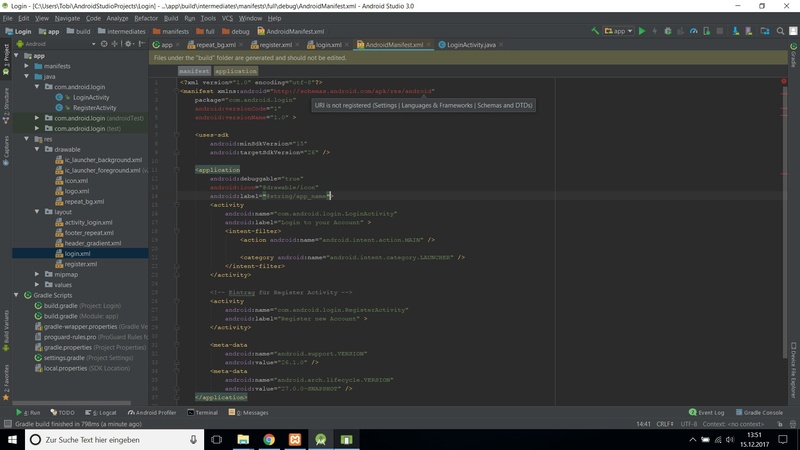 In this tutorial the main focus is to creating android login, registration screens and navigating/switching between them. 1. Create a new project by going to File ⇒ New Android Project. Fill all the details and name your activity as LoginActivity. In login screen we have header with a logo and gradient background color. Design your logo with different dimensions for high-density( 72px height), medium density ( 48 px height) and low density (36px height). 6. In login.xml add the following code between the header comments. In login screen footer has a background repeat image. When you flip the device in horizontal direction you can see the footer with background repeated image. 7. Create a new xml file under res/layout and name it as footer_repeat.xml and type the following code. Login form contains two textfields with labels and a login button. In your login.xml file add the following code next to footer section. android:text="New to Twitter? Register here"
The registration form also had the same header and footer, but the form changes. The registration form contains fields like full name, email, password (if needed retype password). The following is the code for registration screen. android:text="Already has account! Login here"
12. Finally add entry for the newly created RegisterActivty.class in your AndroidManifest.xml file. Run your project by right clicking on your project folder ⇒ Run As ⇒ 1 Android Application. You will see an awesome output. Thank you mister Ravi Tamada. Your tutorials are awesome!! Hi ravi. did you use android studio or eclipse?